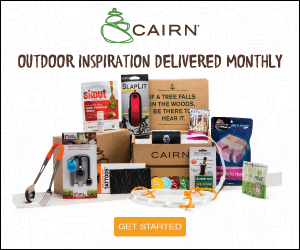 The Coleman Tenaya Lake Tent Review (8p) – Is It Right for Your Family? As your kids grows so will your tent. 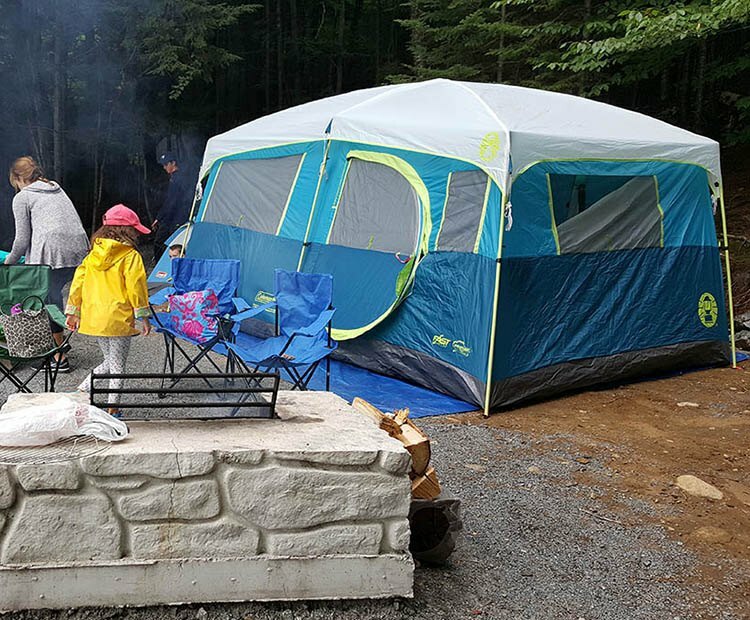 A family of five, like mine, quickly outgrows the typical 4 to 6 person tent pretty quickly. 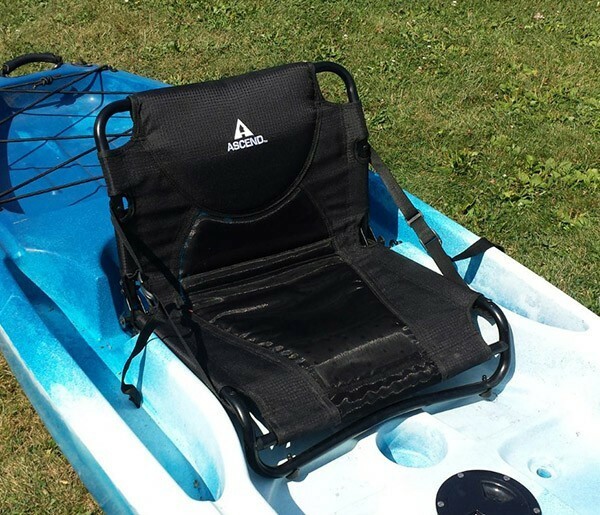 Especially when you add gear and the ‘necessary’ comforts of home for the kiddos. 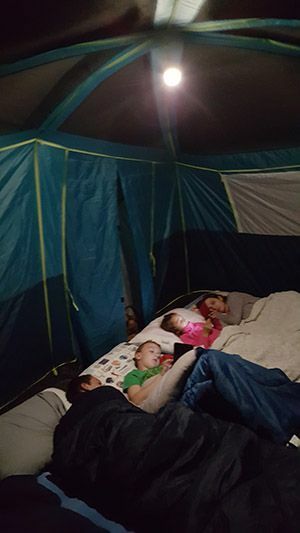 The Coleman Tenaya Lake Tent was the next step up for us and maybe it’s right for your family too. 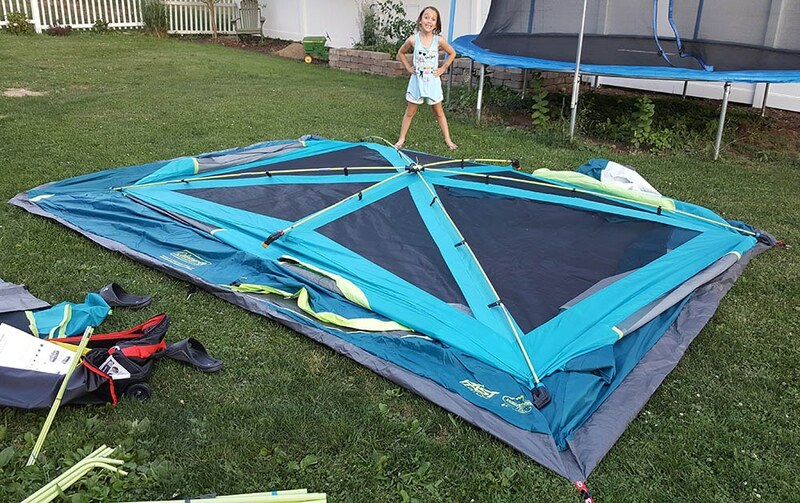 This article is my full review of the Coleman Tenaya Lake Tent, ‘Fast Pitch’ 8-Person, which we bought for our summer family excursions. After plenty of research I actually found this one set up in my local Field and Stream which gave me a chance to check out all of the features and the ‘actual’ space. 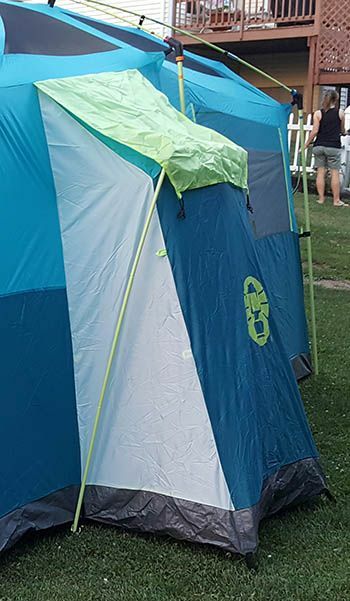 So many tents claim to be 6 person or 8 person but are built small with no space for gear. Our last tent was a 6 person and the five of us were always packed in like sardines. With lots of windows, plenty of space (I’ll talk about the gear closet later) and an easy set up system, I thought it was one of the best ‘big family tents’ I’d seen. It breaks down into a rolling duffel bag with a plastic bottom which is nice since this tent is pretty heavy. I’ll start with the Pros. 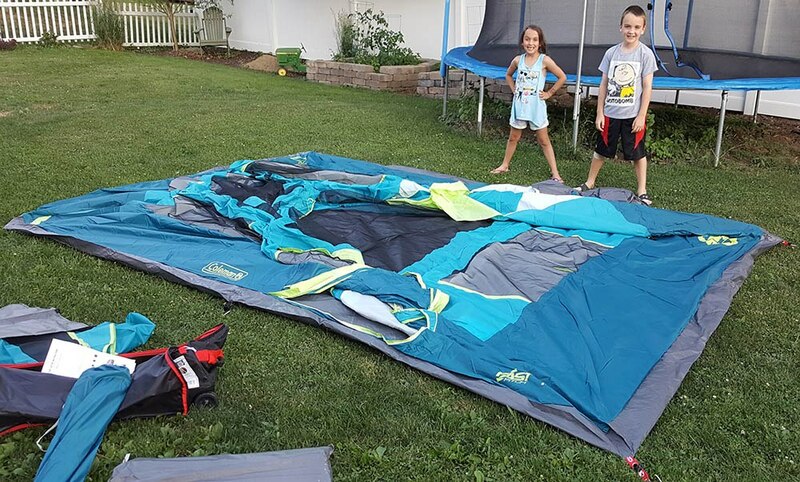 The Coleman Tenaya Lake Tent is part of Coleman’s ‘Fast Pitch’ line which, as you might have guessed can be pitched very quickly. It can be single handed, but goes up in minutes with one or two helpers. Once the tent is spread out it’s a matter of assembling the roof pole structure and then the uprights. The center star has 6 connected poles, one for each corner and two shorter poles for the sides. 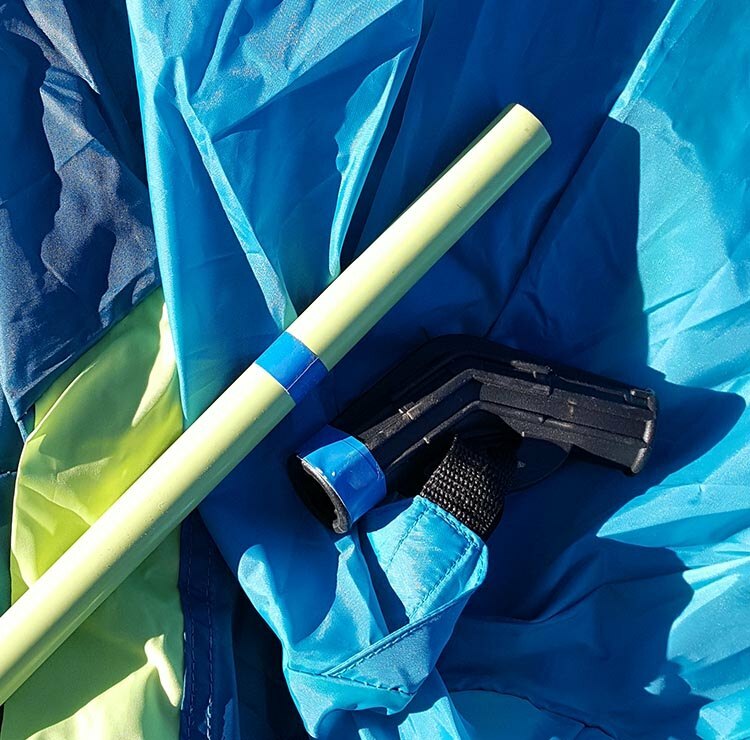 Place it in the center of the tent, secure it with the ties, extend the poles and connect them to the side brackets. Each one is color coded so you can match them up quickly. The roof of the tent has six rows of plastic clips, once they are connected to the corresponding pole the roof is done and you’re ready for the uprights. As with the roof poles, the uprights are all color coded. 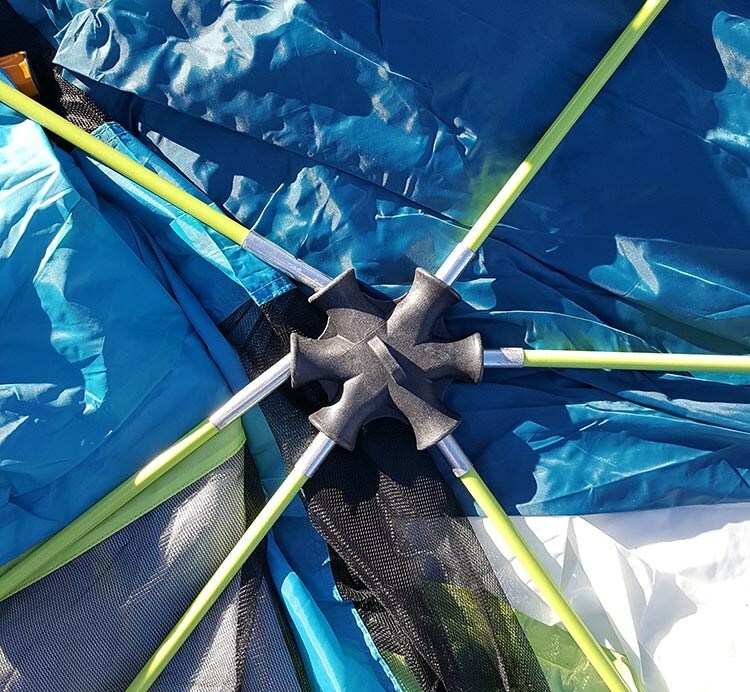 Connect each pole to it’s matching joint and bottom grommet, fasten the plastic side clips and you have a tent. All that is left to do is thread the thin poles through the door which swings open and closed. The gear closet also has three small exterior poles of it’s own that need to be assembled. It takes about 10 minutes to put it up, from opening the bag to fully operational. It breaks down just as quickly and is the only tent I’ve owned that fits back in the bag every time. The Coleman Tenaya Lake Tent is BIG! The interior dimensions are 13′ x 9′ with headroom of 6′ 8″. There is a room divider that can be easily installed if you want some separation. Rated for 8 people, we fit two queen sized mattresses and a cot with plenty of walking around room. The gear closet makes a big difference and gets your stuff out of the sleeping space. This is something unique to the Tenaya Lake. The Coleman Tenaya Lake Tent is well ventilated with six large windows and an open mesh top. On a clear night the whole roof gives you a view of the stars. 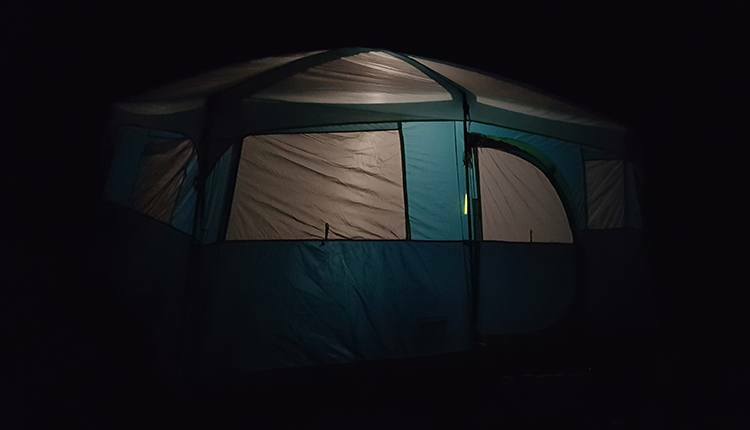 We camped on several hot August nights this year and with all the windows down we were very comfortable. The cross breeze from the open windows keeps the tent from getting balmy when the rain fly is on. The sleeping capacity of tents is always advertised as 2 person, 4 person, and so on. What the manufacturers rarely seem to factor in is that it’s 2 persons and their gear. 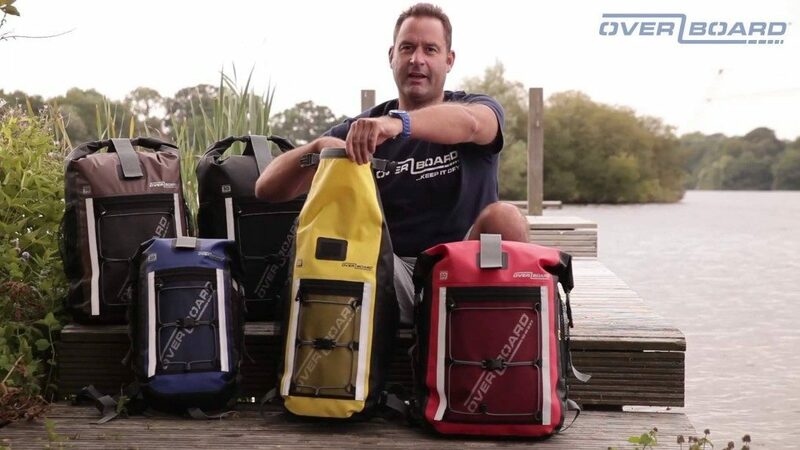 Factoring in the space required to stow gear makes a big difference especially with a family. The Coleman Tenaya Lake Tent is an 8 person tent, and it can sleep 8 people easily if you stack them up. What sets it apart is the gear closet. This gives you a dedicated area, inside the tent but outside the sleeping space, to stack packs and bags. 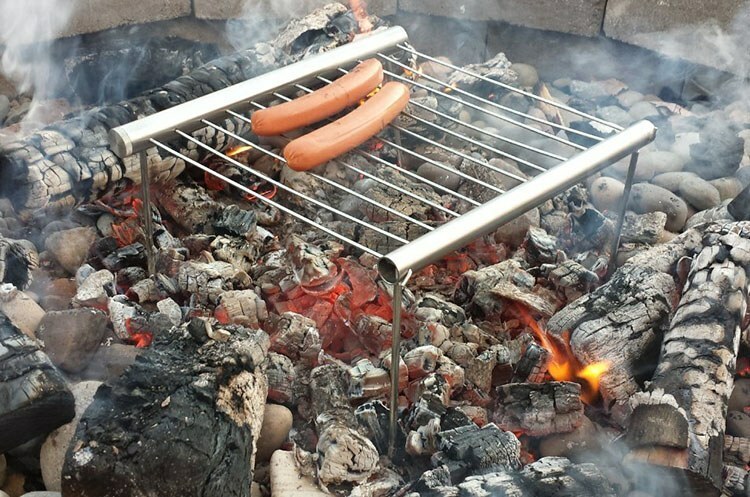 It measures 2 feet long by 2 feet wide by five feet high. The interior closet door can be shut with Velcro fasteners turning it into a handy changing room. You can see from the photo of the outside that it has it’s own structure with poles and a rain flap. 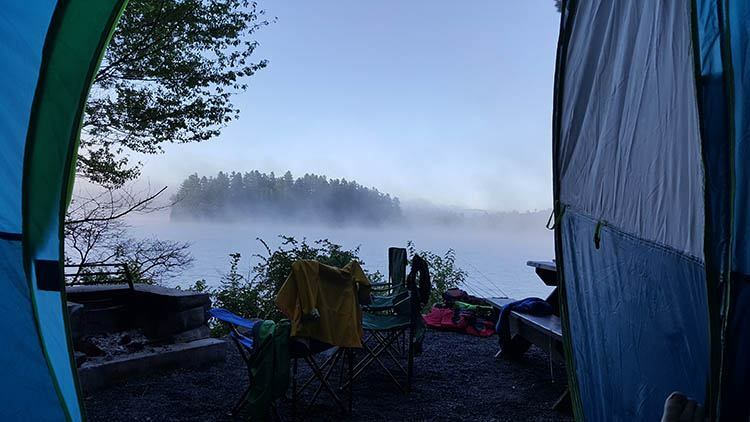 Zipping and unzipping the door to your tent, over and over again, can be a hassle when you’re loading and unloading gear, or when the kids are constantly running in and out. It always ends up wide open and an invitation for mosquitos. 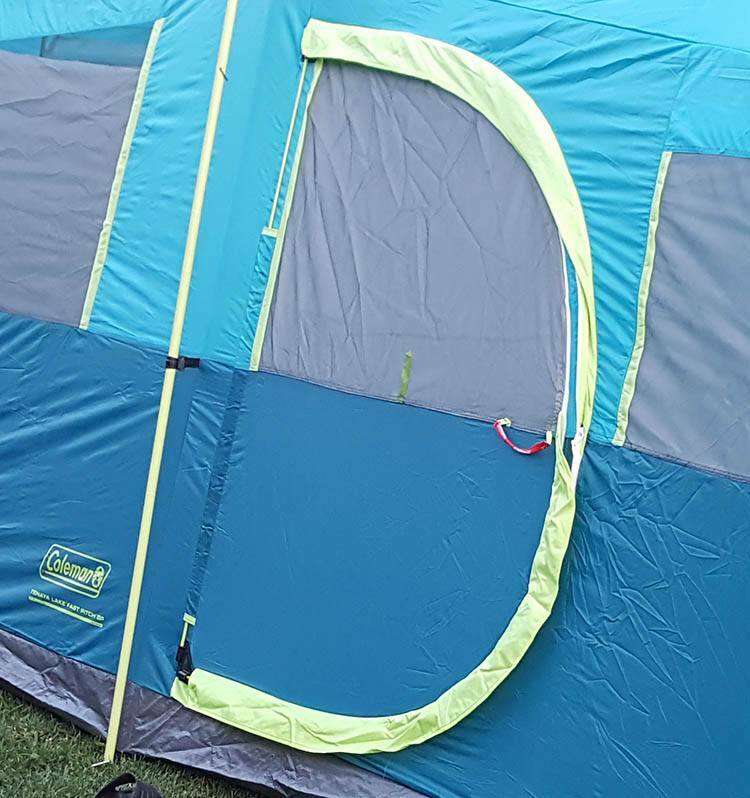 Coleman designed a real door in this tent that swings open and shut. One upright pole serves as the hinge and a second pole in the shape of a ‘D’ creates the door. Velcro around the edges keep it closed so you don’t have to fully zip it until you want to. The door is also large enough for a great morning view…. 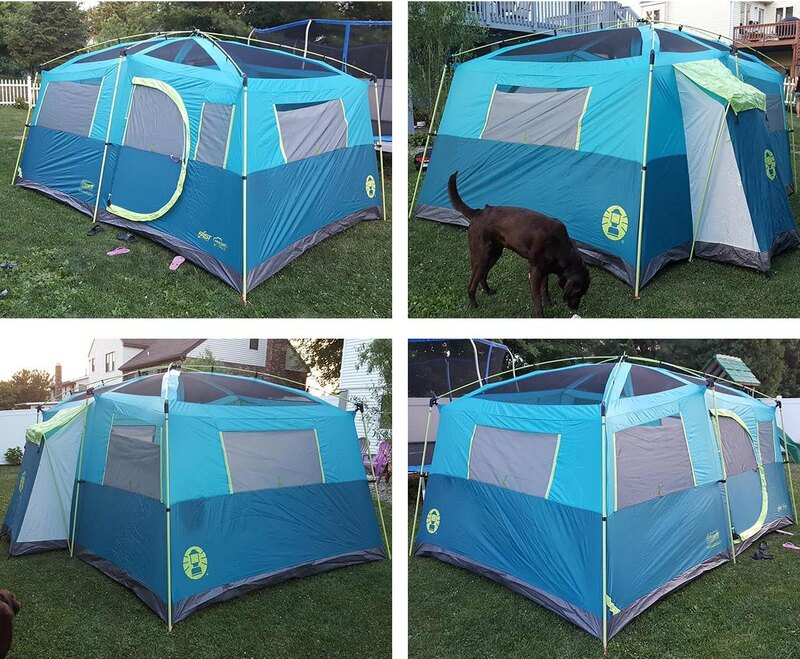 The price for a quality 8-person family tent ranges from $175 to well over $300. 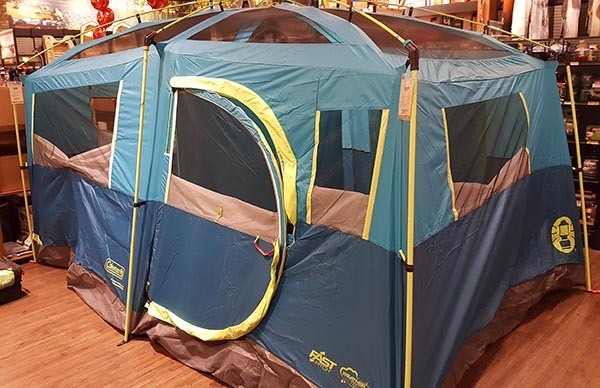 The Coleman Tenaya Lake tent is priced well below that at around $150. That’s a lot of tent for the money! You can bet that any tent that comes in a roller bag is not light. This thing weighs over 33 pounds and is a true car camping tent. While the bag comes in handy getting the tent through the garage, down the driveway, and in the back of the SUV, once you get to the campsite it’s sort of useless unless you want to slam it over roots and rocks and trash the plastic wheels. 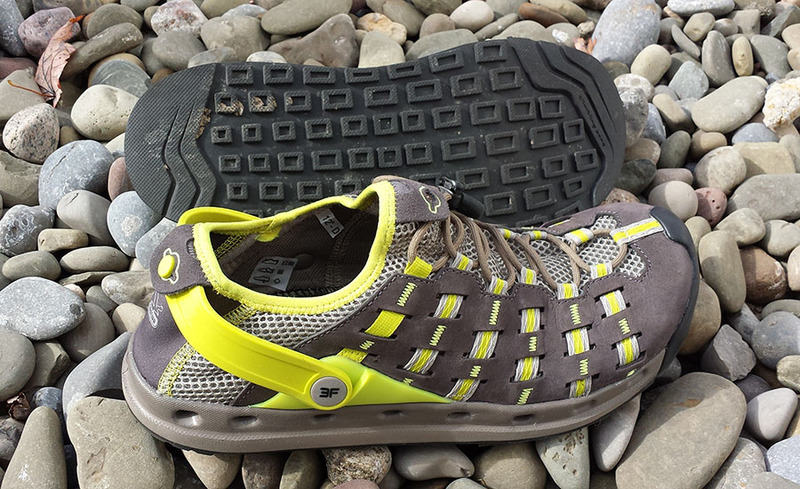 So pick a site that’s not too far to walk because you will most likely have to carry it. Relative to other tents in this class, it’s weight is very comparable. This is a water-resistant tent, not a waterproof tent. 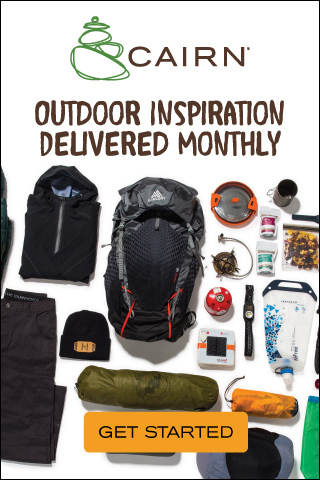 We’ve used it in the rain more than once and as long as you do your best to stay off the walls inside, it’s fine. Driving rain is where the Tenaya Lake is prone to moisture. There are lots of windows and a rain fly that only covers the mesh top. So if the rain is coming in sideways, the best you can do is zip the windows up tight and hope for the best. 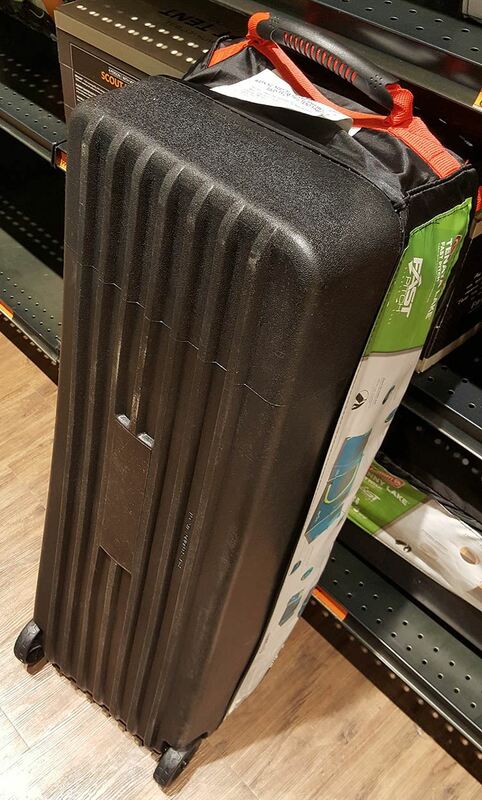 The heavy bottom pan comes up about 10 inches off the ground and keeps your floor dry even with pooling water around it. I have read a lot of ‘big family tent’ reviews and few, if any, of the competitors are water tight. Part of the problem is the expectation that a tent shaped like this would be. 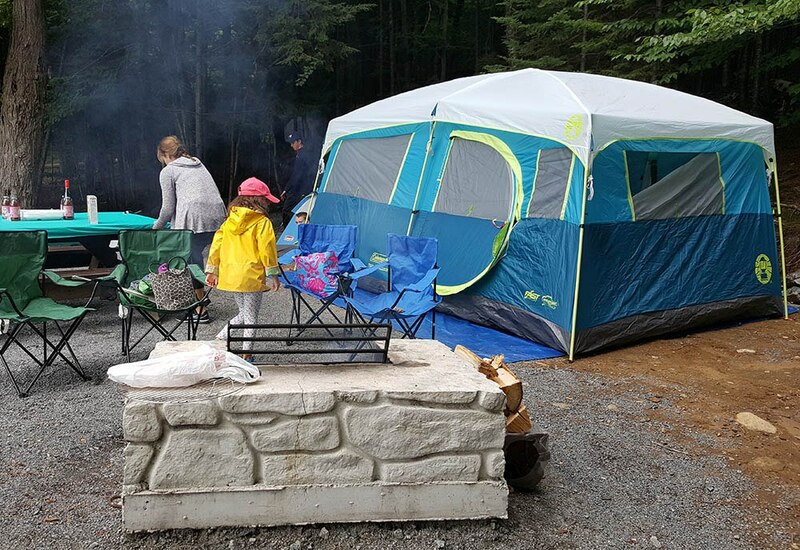 With high vertical sides, tons of windows and a small rain fly… they are made for space and fair weather family camping. I’ve had no quality issues with my tent. Setting it up, you stretch the material pretty hard along the roof line but I have never had a seam pop, fabric rip or anything like that. The only reason I wanted to bring this up is if you read other reviews you will find a few that had this issue. Tears in fabric and seams. I can’t speak to them, it hasn’t happened to me, but wanted to make everyone aware of it. 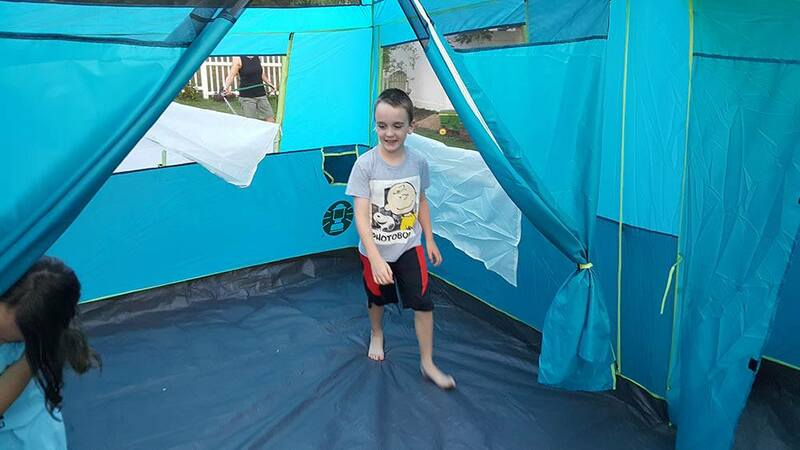 Is the Coleman Tenaya Lake Tent Right for your Family? 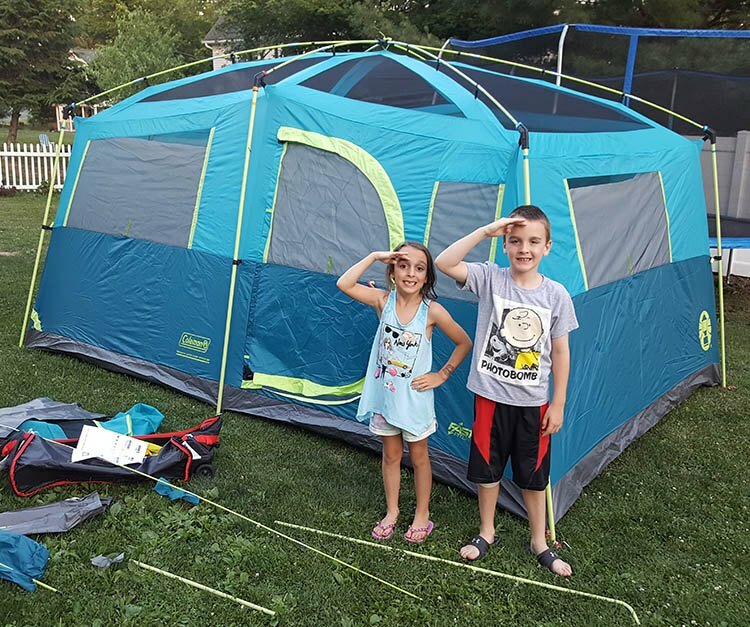 If you and your family are looking for a very spacious tent, that sets up in minutes and breaks down just as fast, that’s comfortable with extra space for gear and doesn’t cost a fortune, then you should definitely put the Coleman Tenaya Lake Tent on your list. We used it all summer and couldn’t be happier with it. 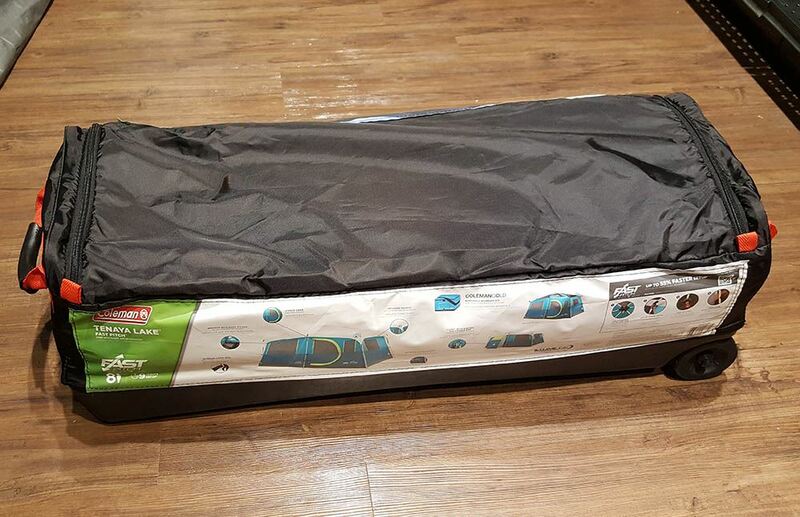 PreviousREI Camp Folding Cot Review. Great Sleep, Great Price. NextSawyer Mini Water Filter, Appalachian Trail Tested!